When you just want to carry the minimum, this bag is PERFECT! It will fit any phone in the outer pocket for easy access. Put it inside and zip it closed if you want to keep it secure while riding. There's just enough room for your phone, cash, lipstick and credit card. All bags from the Hip Bag Company are handmade, so no two are ever exactly alike. They're as individual as you. They RECYCLE old handbags, VINTAGE jewelry and EXOTIC leather remnants to produce stunning works of art that you wear on your hip! 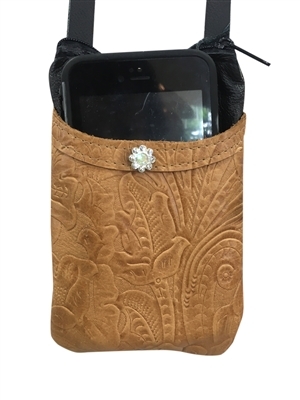 This is a black cowhide leather purse with a sand color print suede leather front pocket. The accent piece is a crystal flower. The handbag can fit all Epi pens and Diabetic syringes. The outer pocket in the bag is large enough to hold any of the huge smartphones out there, including the iPhone 8 PLUS and ALL Samsung phones! Wear the bag clipped onto your belt loops for hands-free carrying of your essentials. It has a zipped top, a small interior pocket that can hold an ID and a few credit, plus there's a matching strap inside the bag. Add the strap when you want a completely different look, or if you're wearing leggings or something without belt loops. Dimensions : (L) 7.5" x (W) 5"
The first one who puts this cutie in their shopping cart gets it. This is the only one available. Photo is shown with an iPhone 6s Plus. Bag is sold without phone.